When I was much younger, I use to belong to those monthly cooking clubs that would send you a pack of recipes every month divided by categories: Meats, Cakes, Vegetables and so on and on. They would send you a cheap plastic box holder with these colorful coded-code tabs and you end up collecting recipes cards, putting them in each of the slots until you end up with a lot of recipe cards. After 20 plus years, I still have my plastic container, with about 500+ recipe cards. During those 20 years I must have use this on and off, I was not a good fan of the cards, they were laminated so you could not make any notes on them and once out of their plastic container I would easily lose them (I was not very organized back in those days). Plus, once I discover cookbooks, these were put in a dark corner, never to be used again. Why I still have them, I have no clue – call it nostalgic, I just cannot bring myself to give them away. Out of the collection of recipes cards I have been making this one constantly throughout the years. It’s an easy, fast recipe, perfect for a weeknight family feeding or a fancy dinner party. I have served them in both situation and it has been a hit every single time. The tarragon sauce has an amazing flavor, the sautéing of the pork with the butter and mustard creates such a hearthy flavor profile that just intensifies when the tarragon is added to the mix, which then gets all nice and balanced by the addition of the cream. This is one of those that you will be making over and over for years to come and a sure hit every single time. If using medallions, you need to gently pound each piece of pork between 2 sheets of plastic wrap to 1/4-inch thickness with flat side of a meat pounder or a rolling pin. (If using cutlets, they should be thin enough) Pat them dry and season with salt and pepper. Then coat them all over with the mustard and put aside at room temperature for about 15 minutes. Heat the chicken stock and put aside for later use. In a heavy skillet over moderately high heat, use about ½ of the butter and without crowding, sauté half of the pork turning over once, until golden brown, about 4 minutes total. Transfer to a plate and finish the rest of the cutlets using the rest of the butter. At the end of the sautéing your pan will have the fat and brown bits created by the butter and mustard stuck to the bottom of the pan – you want this, this is where the flavor of the sauce will come from. Add the dry tarragon to the hot skillet and with a spoon or whisk scrap up the brown bits left over by the pork, moving the tarragon around. Add the chicken stock (carefully since it will bubble up pretty fast) and continue to scrape the pan as it boil until the sauce is slightly thickened, about a minute of so. Pour the sour cream (or heavy cream) and mix in, reduce the heat to medium high. Return the pork to the pan plus the drippings and cook for about 5 minutes or so - until the sauce is thick and creamy and the pork is fully cooked. Turn off heat and serve. This goes great with mashed potatoes or white rice. Any left over can be used as a great pasta sauce. Cut the cutlets into bite pieces, warm up and add additional cream to thin it out a bit and pour over your favorite prepared pasta. 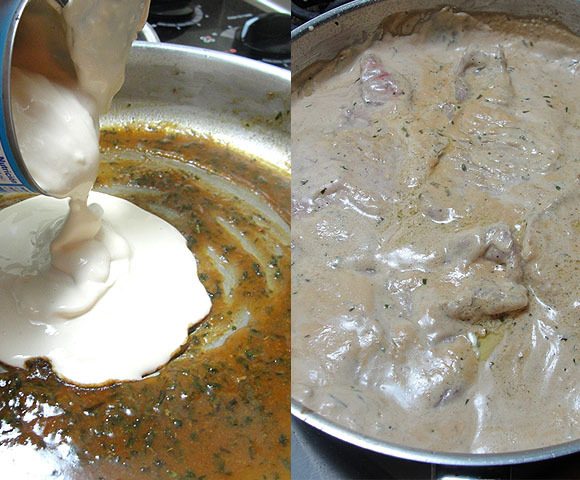 If you find the sauce too thick, you can add a bit of milk to thin it out.